The retrogaming comes to Android smartphones thanks to a special accessory: Hyperkin Smartboy, a device that allows us to play all Game Boy titles on mobile phones. In fact, Hyperkin is a company dedicated to the development of gaming peripherals that in recent years has been proposed repeatedly, creating a number of attractive features such as SupaBoy solutions, to return to play video games from consoles of the 80s and 90s. 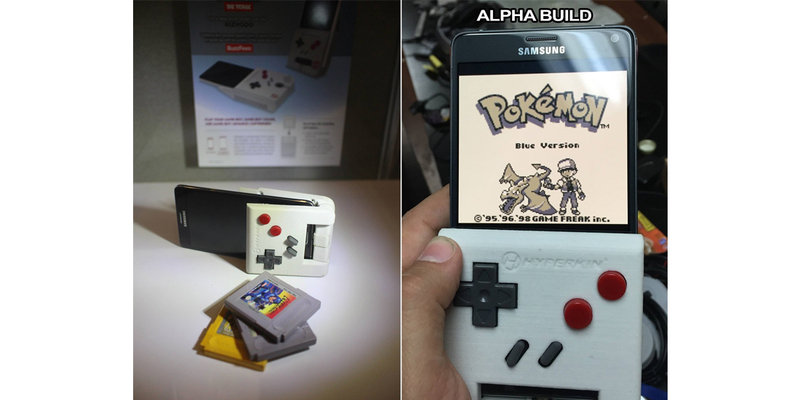 If you are one of those gamers who miss the famous portable titles from consoles of the past, especially the old Game Boy, the initiative developed by Hyperkin will you be very ​​interesting, and not only for you, but for everyone who want to experience the thrill of introducing the cartridges containing video games and play games that have made history, right from your Android smartphone. This new concept of retrogaming, initially born "as a joke" as a kind of April Fools Day joke, but ultimately has obtained such strong emotional response from the public, eager to see really a similar device, that has become reality. Fans of Nintendo have had what they wanted in a short period of time: Hyperkin has shown the first Smartboy at E3 2016, where viewers were surprised by an unexpected device. Hyperkin Smartboy is, in fact, a plastic box for phones, which includes the typical physical buttons of the classic Game Boy and a rear cartridge slot (a game of Pokémon was used to demonstrate its performance during the convention). Then the system was installed on a Samsung device in order to show the final concept. Confirming the presentation is that the development of the initial concept for the moment is compatible only with Android phones, although a future migration to iPhone is not excluded. At the moment it is not known what firmware the device is using, or if it provides some games when purchasing, mostly imported from the East, and if any will not be compatible with the specifications of Hyperkin Smartboy; but the wait should end in December when the device will be launched to the delight of all who want to emulate games in black and white or color wherever they are, without having to resort to complex installation procedures.